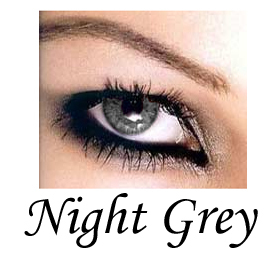 Dual Night Grey Colour Lenses, also known as Grey 3, make your eyes look bigger and more attractive. These lenses provide more colour definition and deeper contrast and are suited to those wanting a more vibrant, richer colour change. One look at your night grey eyes would spell nothing less than S-O-P-H-I-S-T-I-C-A-T-I-O-N. Flaunt your eyes with the flattering shade with Coco Contact's Dual Night Grey lenses. Its dual color layer has vibrant colors that simply attracts people to look at you. Get your pair now. Please visit an optometrist every 2 years to ensure the health of your eyes. It is the best thing you can do for yourself. This gorgeous model is wearing grey contacts so you can see how dark they actually are. As you can see they are not quite black, not at all brown but they are beautiful grey contact lenses. These grey contact lenses can be cosmetic contact lenses or you can get them with a prescription. To specify the prescription, please state your prescription in the comments when completing your order and please allow an extra week for shipping in case we do not have your prescription in stock. •The lenses have a 90 DAY wear..
•These lenses ARE a soft contact lens.